We'll travel along various sub-terrestrial passages as we trace underground transportation's influence on Philadelphia's growth and development--and examine the visionary ideas that never came to fruition. While we won't be entering any areas closed to the public, (do that on your own time! we've tracked down the history of pretty much all of the abandoned tunnels and ghost stations those unrealized plans left behind and have found rare images to show you what they look like. We'll dig into the big questions, like why Philly has so few subway lines, plus answer a host of small ones, such as: What happened to "The Greatest Subway Station in the World"? Why there's an abandoned tunnel and station under Arch Street? And what surprise did engineers discovered when they started digging under City Hall? Questions, concerns, conundrums? Contact Hidden City project director Pete Woodall at 267-259-7112. Meet at the southeast corner of 13th and Wood Sts. When David Lynch moved to Philadelphia in the late 1960s to attend PAFA, he discovered a city that was both terrifying and inspiring. Explore the neighborhood just blocks away from PAFA that so electrified Lynch's imagination with two guides: Hidden City's Peter Woodall and Lynch--and Eraserhood--aficionado, Bob Bruhin. 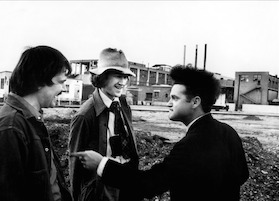 During this one-and-a-half hour walking tour, we'll delve into the area's industrial history, as well as the sights and sounds that inspired Lynch's movies, particularly Eraserhead. Mount Moriah is the largest cemetery in Pennsylvania, and home to some of our city's finest grave architecture. Trees and vines have engulfed the gravestones in some areas, giving the place the feel of a lost city in the jungle. Almost every style of tomb can be found here, from Egyptian Revival to Art Nouveau. Guests will learn about the role of cemeteries as a place for leisure in the Victorian era, as well as the influence of the Freemasons. This tour requires significant walking, so practical shoes and water are a must. Part wilderness and part sculpture-garden, this city of the dead is by turns eerie and poignant. Join Hidden City as we peel back the canopy and reveal the wonders below. Meet in front of Powel House, 244 S. 3rd Street. For stunning late Victorian Gothic Revival architecture combined with fascinating social history, it's tough to beat Church of the Advocate at 18th and Diamond, the final stop on this tour but the first thing we want to tell you about (we didn't want to bury the lede!). The church's progressive social practices began at its founding with the abolition of "pew rents" and reached their height in the 1960s and 70s when it hosted the Conference of Black Power, the Black Panther Conference and the first ordination of women in the Episcopal church. We'll step inside the church's magnificent sanctuary, where a series of 14 murals painted in the 1970s depict scenes from the African-American experience in the company of guide Judith Robinson, a longtime resident of neighboring Strawberry Mansion. The tour will begin at Broad and Master, site of famed 19th century Shakespearean actor Edwin Forrest's mansion and now home to the Freedom Theater. We'll walk up Broad Street from there, and talk about Father Divine, the Columbia Avenue riots, Reverend Leon Sullivan's program of African-American economic empowerment, the long lost Monument Cemetery, Temple University's recent construction and expansion plans, plus a whole lot more. You'll never look at Philly the same way again. We guarantee it! North Broad Street is a vein of pure architectural gold, but when was the last time you actually walked from Center City to Temple University (or vice versa)? Well, here's your chance to give this stretch of the city the attention it deserves! Guide Jerry Silverman is a certified member of the Association of Philadelphia Tour Guides. He earned a Bachelor of Hebrew Literature and a Master of Jewish Education, and has taught Hebrew and Judaica at numerous institutions including Gratz College. Jerry served as the High School principal of Temple Beth Sholom in Cherry Hill, NJ, as well as the Educational Director of Temple Beth Zion-Beth Israel. Since 2009, Jerry has been giving tours as part of the Philadelphia Mural Arts Program, including developing a special Jewish-themed tour. He is a founding member of the Museum of American Jewish History and was on the boards of The Little Shul and Congregation Rodeph Shalom. Meet in front of Rebecca Gratz Club apartments, 532 Spruce St.
From the 1880's through the 1920's the area between Spruce and Christian Street and 2nd and 6th was the Philadelphia equivalent of New York's famous Lower East Side. Jewish immigrants from Eastern Europe created a vibrant community with its own Yiddish Theater, literary societies and newspapers, along with synagogues and banks, bath houses and delicatessens. This walk begins at the former Rebecca Gratz Club, 532 Spruce Street, with an introduction to early Jewish life in the Philadelphia, and then continues to explore the rest of the “Jewish Quarter”, pointing out sites of former bathhouses, shuls, newspapers, theaters, stores, social service buildings, union halls, banks and hospitals, as well as the still-active Society Hill Synagogue and Congregation Bnai Abraham, and several businesses along Fabric Row. Hear about the dramatic Kosher butcher strike of 1911, the ongoing debate over the origin of the first hot-dog roll, and which short-lived local newspaper used to publish articles by Sholom Aleichem. Meet in front of the Rebecca Gratz Club Apartments, 532 Spruce Street. Jerry Silverman is a certified member of the Association of Philadelphia Tour Guides. He earned a Bachelor of Hebrew Literature and a Master of Jewish Education, and has taught Hebrew and Judaica at numerous institutions including Gratz College. Jerry served as the High School principal of Temple Beth Sholom in Cherry Hill, NJ, as well as the Educational Director of Temple Beth Zion-Beth Israel. Since 2009, Jerry has been giving tours as part of the Philadelphia Mural Arts Program, including developing a special Jewish-themed tour. He is a founding member of the Museum of American Jewish History and was on the boards of The Little Shul and Congregation Rodeph Shalom. September 16, 2018 Exploring David Lynch's "Eraserhood"
June 03, 2018 Exploring David Lynch's "Eraserhood"
April 15, 2018 Exploring David Lynch's "Eraserhood"
November 19, 2017 Exploring David Lynch's "Eraserhood"
October 07, 2017 Exploring David Lynch's "Eraserhood"
May 14, 2017 Exploring David Lynch's "Eraserhood"
April 16, 2017 Exploring David Lynch's "Eraserhood"
October 15, 2016 Exploring David Lynch's "Eraserhood"
September 24, 2016 Exploring David Lynch's "Eraserhood"
April 23, 2016 Exploring David Lynch's "Eraserhood"
July 11, 2015 Exploring David Lynch's "Eraserhood"
June 13, 2015 Exploring David Lynch's "Eraserhood"
June 06, 2015 Forgotten North Broad Street--SOLD OUT! May 10, 2015 Underground Philadelphia: Subways, Railways & Stations--SOLD OUT! April 17, 2013 Preserving Philadelphia Modernism: Are We Finally Ready?